The best story of the trip has been Taro Hirose. March 9 he played his last game at Michigan State. Ten days later he made his NHL debut at Madison Square Garden, earning an assist when he set up Frans Nielsen. 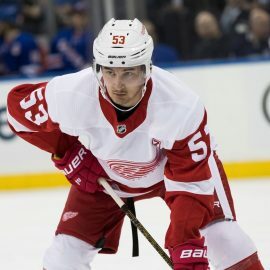 Two nights later, Hirose showed off his smarts when he got his own rebound and, having spotted Thomas Vanek by a goalpost, directed the puck to the net knowing Vanek’s prowess in the area. A third assist came at Vegas. Hirose, 22, grew his point streak to four Monday when he stole the puck off the stick of Sharks forward Joakim Ryan and set up Athanasiou. It’s a small sample size, but Hirose is giving impressive notice. After the Blues game, Thomas Vanek — the best passer on the team — praised Hirose’s hockey IQ. The Wings are so injured that lines are a patchwork, but Hirose’s situational awareness is noticeable in any grouping. Hirose is an undersized forward (5-10, 160) and he isn’t a fast skater, but like Vanek, he’s savvy. It’s going to be interesting to see how he does next fall in camp, if he can build on this and earn a spot.